So your wedding is finally coming up. As exciting as it is, in the back of any bride's mind is the question: how much is this all going to cost?! Unfortunately, in most cases, weddings are crazy expensive. Between the flowers, food, music, lighting and of course, the dresses, wedding costs can reach tens of thousands of dollars. And all for an event that lasts only a few hours! Fortunately, there are ways to cut the costs. Today, we go through a few ideas on how to save on wedding dresses – for the brides, the bridesmaids, and mother of the bride & groom. Let's face it – a bride will wear a wedding dress only once. Even if she gets remarried, tradition dictates that a new wedding dress is bought. That leaves many past brides with wedding dresses hidden away without use in their closet. Many of them, in a desperate desire to finally rid themselves of the dress and regain the closet space, sell them for significantly less than they bought them. Look for opportunities to buy these second-hand wedding dresses so you can still rock a high-quality dress for much less! Giving up on the idea of buying an elegant, expensive wedding dress may be difficult, but in many cases, it's a must. Considering that the wedding dress is only used once and then stored in the closet, it's hard to justify spending thousands of dollars on it. That's where budget online stores like The Green Guide come in. Their wedding dress prices are extremely fair, starting at only $69. The garments are stunning as well – from backless to vintage to corset wedding dresses, they have a number of available options for brides. You can buy a nice looking dress that doesn't empty out your pockets and still has you looking stunning on your wedding day. And what about moms and bridesmaids? They also shouldn't be spending so much money on their dress! For mother of the bride [MOB], you can find beautiful, classy options in a variety of celebratory colors. You can even find plus size dresses that will fit bigger frames. All in all, it's a great way to spend little on dresses but wear a stunning piece to the wedding. Styles may have changed from era to era, but there's still hope for mom's wedding dress. If any family member has saved their wedding dress and would like to pass it down to you, take advantage of the freebie! It's far less expensive to alter an older wedding dress than to buy a new one. I know of a family that has passed down the same wedding dress generation after generation. 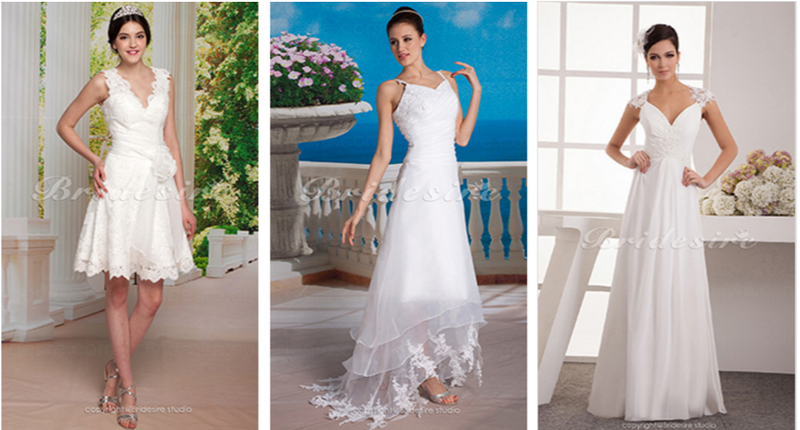 Each new bride alters the dress to fit her size and style, creating a beautiful and meaningful tradition. Not every wedding dress needs to be a surreal princess-style, intricate dress with sewn-in pearls and gems. End of the day, what's traditional is for the bride to wear a white dress. So why go over-the-top when a simple, beautiful white dress will do? And buying a simple dress is far easier and cheaper than purchasing a wedding dress. Head to a fashion store and try on their white dresses. You may just find the needle in the haystack that doubles as both a regular and wedding dress!